In March this year Gordon Seabright took over from Kevin Mayne in the chief executive’s chair at CTC. With a professional background at English Heritage and then the Royal Horticultural Society, as well as being a keen leisure cyclist, Seabright was an obvious choice for CTC which had just assumed full charitable status. 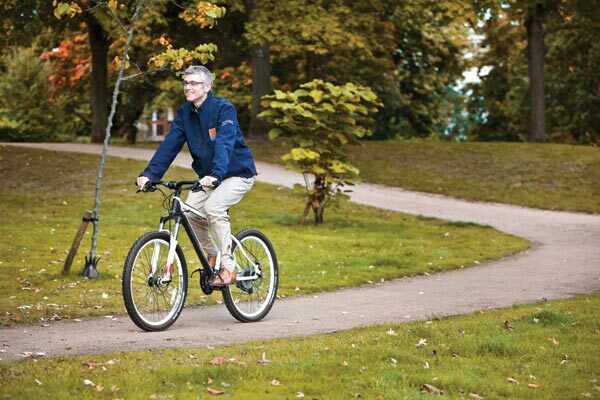 Now, with his hand firmly on the tiller, we ask what role CTC is going to play in the future of cycling in Britain. CW: So, how have your first six months been? GS: I can’t quite believe where those six months have gone. It’s been an absolute joy. Coming into the world of cycling is a rare pleasure anyway but right now, after the incredible summer we’ve had, there has clearly never been a better time. Also CTC is such a fantastic organisation, with a great heritage, really enthusiastic campaigners, and I happened to join just as we secured charitable status so we can now proudly call ourselves the national cycling charity. We’ve also got a record number of members – 70,000 – so we’re the biggest cycling organisation in the country too. Have you been surprised by anything in the British cycling community? GS: I think there is a need for us to change the tone slightly in the way that we talk as a community. I’ve always thought of cycling as a really joyous thing to do, but a lot of the time we in cycling come over as being the angry brigade. We do have some stuff to be angry about, no question about it, and I don’t want to take the edge off our campaigning. But I think one thing that we can surprise the rest of society about is having a really positive tone of voice, and creating a spirit of celebrating the thing that we do and the thing we want other people to do. Another thing that is important for us to talk about is that there is no right way to do cycling. One of the things I’m passionate about with CTC, and one of the things I love so much about the organisation, is that there is no right sort of bicycle, there’s no right sort of clothes to wear while you’re riding. You don’t need hi-viz, you don’t need a helmet, you just need to get on a bike. It’s the most gloriously simple thing to do and we’ve got to make sure new people don’t feel that there are barriers. Obviously everybody benefits from a bit of training or insurance, but in general it is the most all-embracing of activities. Will CTC be changing in any way to reflect this? GS: Yes, I think it is quite big news that we are the national cycling charity; that carries some implications. We’re just finalising a new strategy at the moment and it knits together our various responsibilities under three headings. As the national cycling charity we are there to protect cyclists, and that’s a role that is pretty well understood and involves the insurance we offer, the legal support for our members, and the local campaigning work. We’re there to inspire people to cycle and to cycle more, and we do that through our member groups and affiliated clubs and all the rides that they take people on in our distinct spirit of companionship. And the third thing we do is promoting cycling. As the champion of our members we can talk to government in London or Edinburgh, Cardiff or Belfast with some authority about cycling policy – in Roger Geffen and Chris Peck we’ve got the experts, so we can work with local authorities and national governments to promote cycling for the whole country. Is there a difficulty keeping a balance between being a club serving its members, and being a campaigning organisation serving the whole cycling community? GS: I actually think it’s very easy. In my past life I worked for the Royal Horticultural Society, which is both the membership organisation for 360,00 gardeners and a charity delivering public benefits. And I worked for English Heritage, which again serves its members as a club and it serves the rest of society as a charity. It’s perfectly easy to balance those two things; you just have to keep in mind what it’s all about – it’s all about more people cycling in a better cycling environment. And if you hear me boring on with one phrase over the next couple of years it’ll be about more people cycling in a better cycling environment. With more organisations taking an interest in cycling, and even groups like British Cycling taking on a campaigning role, how difficult is it presenting a unified front for cycling? GS: That’s a hugely important point. I and Ian Drake [British Cycling CEO] and Martin Gibbs [BC policy and legal affairs director], and Malcolm Shepherd [Sustrans CEO], and Ashok Sinha [LCC CEO], and others, put a lot of effort into making sure we speak with one voice. This is an amazing moment of opportunity for cycling and I think we are all aware that if we pursue individual agendas then we’ll waste that moment. So we are spending a lot of time working together and seeing each other. However, I don’t think it is any bad thing that there are several organisations working across different facets of cycling. We’ve all got our own particular areas of interest. That’s fine, but what is important is that we come together in the common good and I’m very happy to say that I see all the signs of that happening. This opportunity won’t last forever. I don’t mean that what we see is a flash in the pan – I think there is a genuine and lasting change in the way that people view cycling. But the opportunity to influence decision makers, the opportunity to have them see cycling as a really high-profile issue, that is something that we mustn’t waste. What do you make of the political approach to cycling at the moment? GS: If there’s one thing that concerns me it’s that we are not yet seeing genuine leadership from government. There is a lot of talk but we really need to see all departments of government from Number 10 down getting stuck into cycling issues and really making a difference. Funding is welcome but it’s not about little bits of funding. It’s about the Department of Health realising that cycling delivers benefits which, well, if somebody invented a pill that delivered the benefits that cycling delivers the pharmaceutical industry would be very chuffed. We’ve got one school that we know of that has 60 per cent of its kids cycling in every morning, but the vast majority are fewer than three per cent, which is pathetic. So we need the Department for Education getting schools behind the cycling message. Obviously we need the Department for Transport completely lined up, but we need the whole of government showing leadership. The same goes in Edinburgh and Cardiff and Belfast. I’m not knocking money going in – that is extremely welcome – but what we need to see in particular is the government lay out how it sees this country developing over the next couple of decades as a true cycling country. They don’t hesitate before laying out a railway agenda for the next 20 or 30 years – although they do hesitate about laying out an agenda for airports! But it’s that long-term planning and deciding what sorts of cities and small towns and countryside we want to have, and then working towards that. How can CTC help with that? GS: We’ve got the Cycletopia idea that we’re about to launch. Cycletopia isn’t some pie-in-the-sky idea about turning our cities in Copenhagen overnight, it’s about things that are already happening in the UK, but wouldn’t it be great if they were happening everywhere in this country? So Lancashire County Council is bringing in 20mph speed limits in its towns – that alone transforms the cycleability of towns in one county, but wouldn’t it be great if that could happen everywhere else? That’s the sort of thing we need leadership from the government to help us achieve. There was some internal dissonance when CTC decided on seeking charitable status – what benefits does being a charity give CTC? GS: Whatever debate there was is settled. We are a charity and I am hugely relaxed about that debate because of my background in organisations that balanced the needs of a charity with the needs of the members. The fact that the membership continues to grow to an all-time high suggests that a lot of people are relaxed as well. But this now really defines our role: we are positioned clearly as the national cycling charity. That’s a nice clear mission for the organisation. There are practical benefits as well, not least financial, but the big thing for me is being able to build on all the heritage of the organisation and being able to speak for cycling and cyclists for the whole country. How often do you get on your bike? GS: At least three or four times a week, normally a lot more. Commuting is my big thing, so I’m out on the Brompton. I live in Wiltshire in a lovely bit of the Vale of Pewsey and it’s super cycling territory, so I can do some lovely road cycling there, and also there’s some great off-road up on the Wansdyke. And are you still enjoying cycling, even though it’s taken over your life now? GS: I’ve actually become more obsessive than ever about my bike. One of the things that intrigues me about cyclists is the way that everybody customises their bike, so I now find myself peering at everybody’s bikes and asking people lots of questions about their choices. In fact, not only am I not tiring of bikes, but I’ve also managed to get my teenage daughters out cycling again, which is wonderful. I think that has to go down as my biggest lifetime achievement!